"For far too long, many have made light of eliminating the undead, with tragic consequences". Well it is about time I did a book review that was a bit more zombie related. 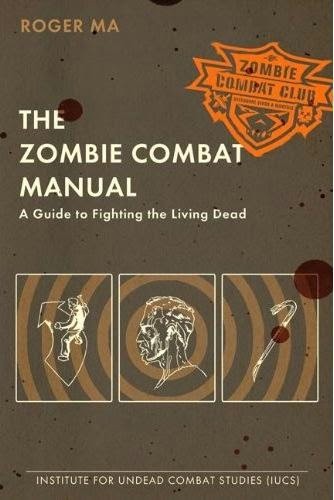 The Zombie Combat Manual by Rodger Ma (along with The Zombie Survival Guide by Max Brooks) is considered a must have text on the subject of the zombie apocalypse. I must admit I found this book scary. It appears zombie outbreaks have been occurring everywhere around the globe and no one told me. And worst, at the time of publication, "contact has not yet been reestablished with Australia". I really must watch the news more often. First up, let's discuss the most vital aspect of any book, the illustrations. For me the quality of the artwork are what make or break a book. Luckily there are a lot of excellent semi-realistic illustrations in this book to help you master the techniques of battling the undead. The zombies look suitable gruesome. I also found the combat reports added a wonderful depth to the subject matter. The people interviewed are varied, giving a very broad perspective on the zombie epidemic. Take Dr Judith Ballantine, Child Psychiatrist, who's latest book "Mommy's Different Now", aims to help guardians educate toddlers on coping with the loss of a parent due to infection. Speaking of toddlers, there is also a section on Child Protection, examining the various ways to carry children in zombie infested zones. Being a fan of Lone Wolf and Cub I was disappointed Roger didn't expand on how you can customise your baby carrier with armor plating, spring loaded blades and other useful weapons. Not to mention benefit of riding strollers downhill, like a skateboard, to escapes zombies. It is certainly a comprehensive manual and maybe too many pages are spent on the various weapons you can use. Then again, if I have to make a choice between a viking axe, a zweihander and a naginata, I now know which to grab (Viking axe). Great to know if the zombies rise up while I'm touring a museum. It is easy to see why this book has become a classic. I'll definitely be heading down to Bunnings this weekend to stock up on landscape shovels and nose plugs. Bite off more that you can chew.